Five Tips To Turn Your Child’s I Can’t into I Can - Energetic Juniors - Contact Us! Every day kids face obstacles that make them feel that no matter what they just cannot do it. They can’t get up in the morning. They can’t do their homework. They can’t exercise. They can’t eat healthy. They can’t engage in the lesson during class. They just can’t. All of these “I can’t” feelings make the “I can” seem impossible. But believe it or not, even in the toughest of times, our bodies find a way to survive and make these tasks happen. Researchers have long understood the idea of “fight or flight” and even in the toughest of times our strongest selves will fight through. Most parents feel a responsibility to make sure their child says “I can.” Here are some tips for parents to help their children make those cannots turn into cans. Remind them of the times “they did”: At every stage of development, when children find themselves incapable of completing a task, regardless of whether they accomplished it in the past, they believe nothing in this world can help them reach that goal. This is the best time to remind them of a specific occasion or similar situation when they were able to complete a task (i.e. putting their toys away when it felt too overwhelming, or tackling a to-do list that felt endless). 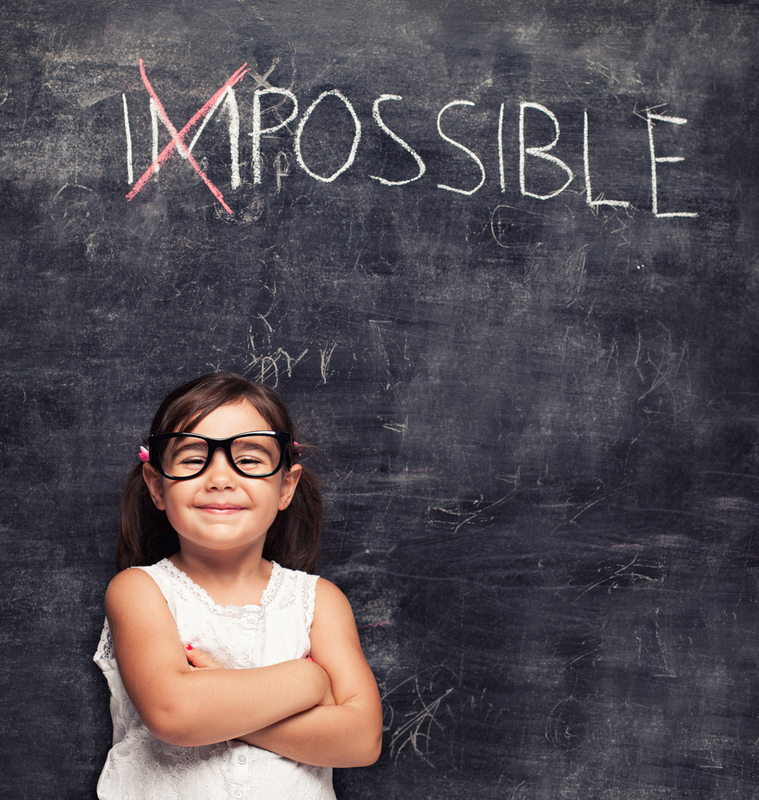 Reminders help encourage children to succeed, even when it feels impossible. Use Motivational Interviewing Skills: Motivational interviewing, a term used in the mental health profession, is a skill that assists the client in restoring and resolving ambivalence in regard to a specific task. Luckily for you, this is an incredible skill to use with your children whenever they feel the “I can’ts.” It helps the child find motivation to accomplish the task that brings them uncertainty in the first place! This would be that time, as a parent, when you can say to your kid, “I told you so!” and not feel guilty about it! Motivational interviewing is most effective when you can prove to your child that he or she has already completed a portion of a task your child claimed unable to do. For example, if the task is going to school, and your child is already downstairs ready to leave, but can’t get out the door, this would be the time to say, “But you’re already dressed, therefore you’re already getting ready to go to school. This is the first step toward getting there.” This will help your child realize that he or she is actually taking the right steps toward a goal. Be their “CAN” cheerleader: Create positive and motivational slogans to help your child before he or she expresses something that can’t be done. If you know that a task may be particularly hard for your child, positive slogans can be used to help motivate. Slogans as simple as “You can do it!” or “It might seem hard at first, but you can succeed” can help kids realize their own abilities. It helps steer them away from saying, “I can’t” to “I can.” Little reminders of their slogans can also be helpful as notes in their lunch boxes or as Post-Its stuck on a bathroom mirror. Help your child break a task into smaller pieces: Difficult tasks can be made easier if you help your child break them into simple steps. Sometimes when children claim they can’t do something, it might be because it is literally too difficult. Creating small steps not only empowers your child, but also helps your child develop coping skills for future situations. For example, if the task involves taking the garbage out, the steps would involve: taking the wastebasket out from under the sink, removing the plastic bag from the basket and tying a knot, and finally, carrying the knotted bag outside and placing it in the big garbage can. Each step should be presented once the previous step is completed to ensure it does not become totally overwhelming all over again! Have an end in sight: In many instances, children feel the pressure of parents wanting them to succeed in a certain way. This can cause them to say, “I can’t” rather than, “I can.” When your child responds negatively to a task that seems rather difficult, try setting an end goal as motivation. Whether this is an actual “reward” for completing a task (such as choosing a dessert that night, or spending extra time with mom or dad by reading a story together, playing a game, etc. ), or the reward comes when you step in to help after your child has tried multiple times on his or her own, your child might experience less pressure knowing there is something waiting at the end. Having an end in sight can help any child feel that no matter what, this experience will end sooner if they try their best, especially if there’s a fun reward at its completion! For more information on Mia, please visit www.LizMorrisonTherapy.com.